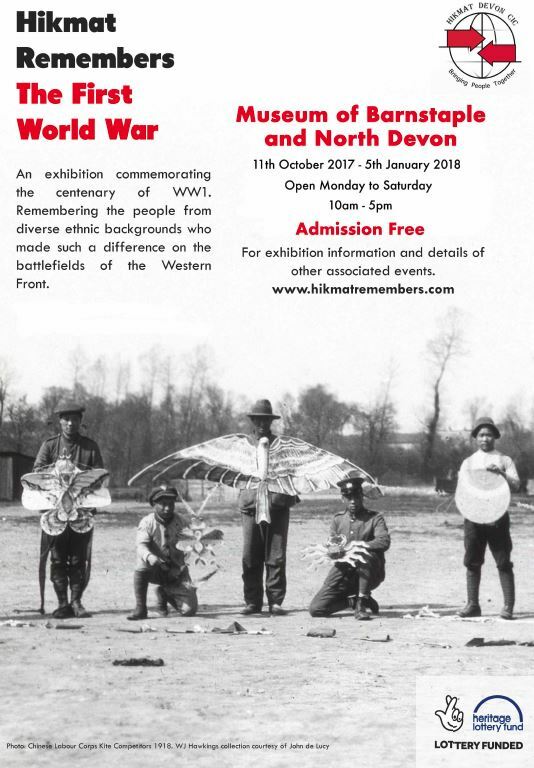 This exhibition represents the culmination of Hikmat Devon's WW1 project, touring venues throughout Devon. Each venue will display a different mix of the projects materials. 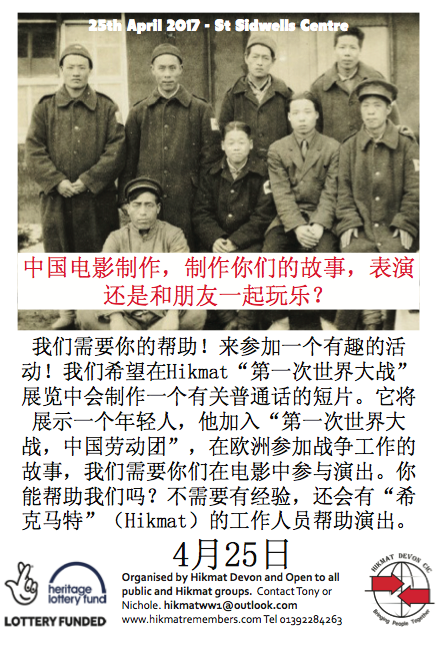 At the Launch held in May 2017, we were excited to be sharing some of the stories and work we have uncovered during the project and are particularly excited to share with the public unseen photographs of the Chinese Labour Corps by W.J Hawkins, with the kind permission and support of John De Lucy. In addition we will be showing a selection of extraordinary prints by Eugene Burnand of men from around the world as represented in the Great War, courtesy of Douglas Jenkinson. The exhibition is free and open to the public. Anyone with an interest in the WW1 will find it a fascinating exploration of a remarkable history. EXHIBITION from 11th Oct, Barnstaple. After two years of running the project we are now starting to bring together elements that we have uncovered, learned and enjoyed, to create a public exhibition. We are always on the look out for other volunteers, so if you are not involved and would like to get involved in helping to create the exhibition then please get in touch. 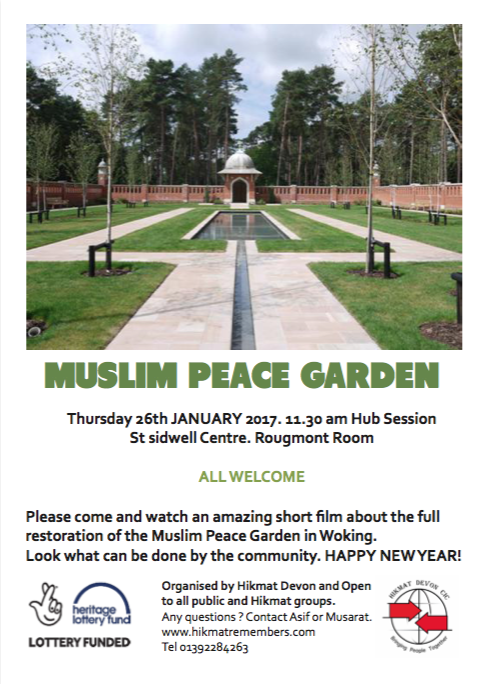 A fantastic trip all the way to Woking. Photo taken in the Muslim cemetery by graves of those who lost their lives during the war. 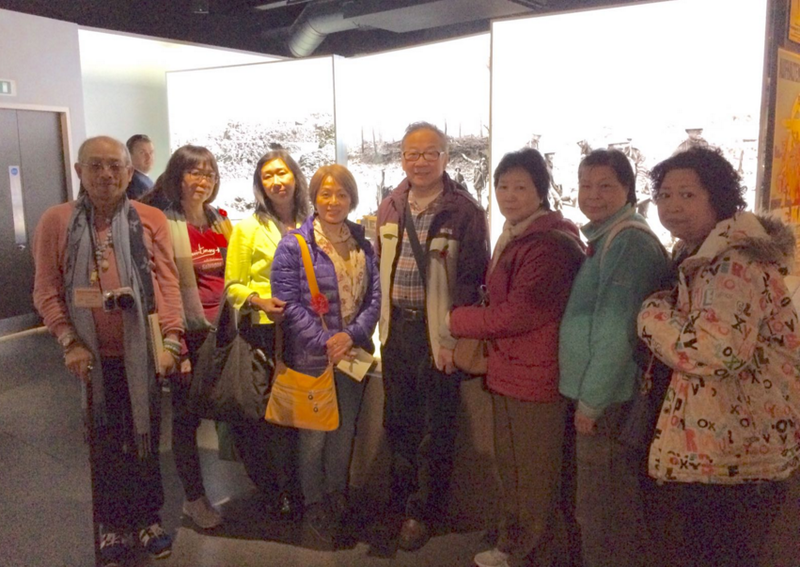 Members of the Chinese group trip to Imperial War Museum. We are thrilled to have Anna Maguire to help us explore the multi cultural WW1 histories at the Imperial War Museum. Anna Maguire is a historian whos focus is multi cultural encounters from WW1. It will be amazing to have her input and share our project with her. Here are some links to her work. We were delighted to be finalists the Remember WW1 Awards. 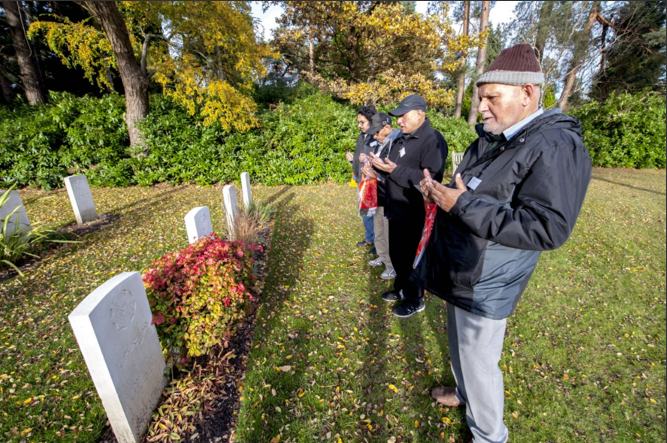 Two members of HIkmat presented the project about the CLC war graves in Plymouth and work our group has been doing to uncover and remember those from China who died there. The awards was a fantastic opportunity to share the project and was an honour to be considered amongst such good projects at a national level. 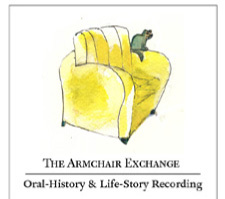 ​Stories of Diverse Communities in the First World War. ​Exeter's Royal Albert Memorial Museum & Art Gallery (RAMM). We are really pleased to announce that Dr Kent Fedorowich has kindly offered to talk about the journeys to the Western Front from around the world. It will be great to have his amazing input again. 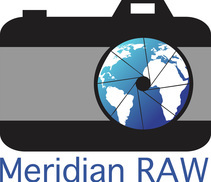 ​More details of the event (workshops and talks) will be released very soon. We are all working hard to make sure that the public get a great insight into the stories and research that we would like to share. 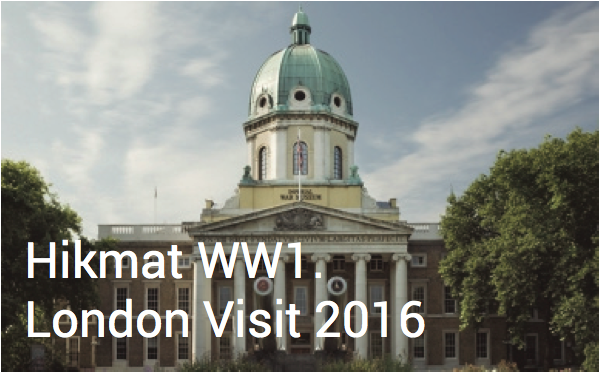 A group of volunteers and mentors are going up to London to visit the Imperial War Museum. ﻿Whilst the first day of the battle of the Somme was on the 1st July, the 14th of July is the date when two regiments took part in the first and only cavalry charge. 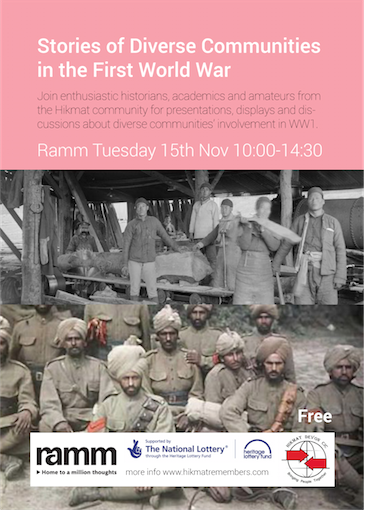 To mark one hundred years since World War One we hope to shine a light on the involvement and sacrifices of Chinese, Indian, African and Asian communities on the Western Front. 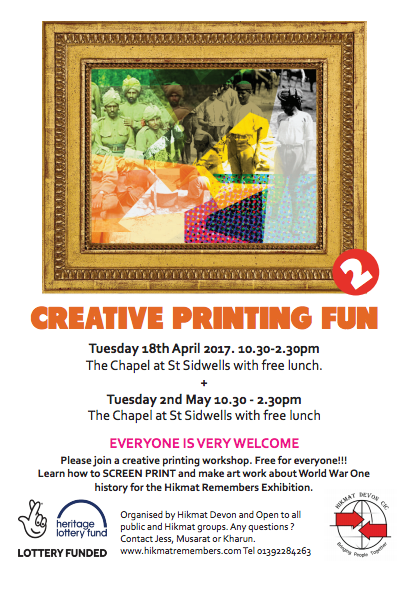 Over 650 Hikmat service users across Devon will have the opportunity to explore and share forgotten stories of diverse communities involvement in World War One. 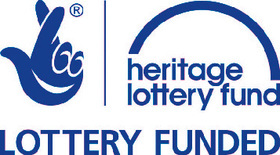 Hikmat Devon has received funding from the Heritage Lottery Fund for this unique project, commemorating the First World War. 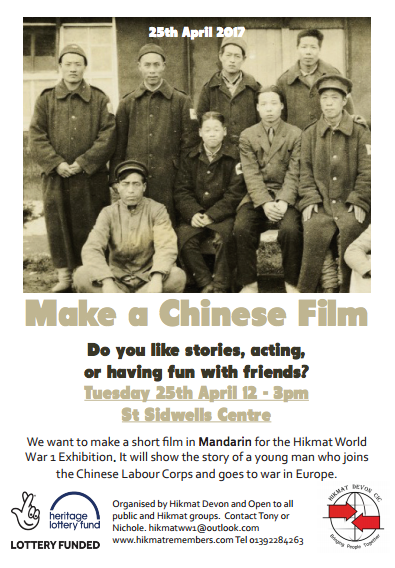 Did you know that over 70,000 men traveled from China to Europe as part of the Chinese Labour Corps and worked on the Western Front. They worked with the British and French armies digging trenches, servicing tanks, clearing mine fields and removing barbed wire. The graves of eight of these men can be visited in Efford, Plymouth. Did you know that 140,000 Indian soldiers saw active service on the Western Front in France and Belgium – 90,000 in the front-line Indian Corps, and some 50,000 in auxiliary battalions? The project runs from April 2015 to 2019.